Dr. Ariele Foster. Carri has taught about 3500 hours and has taken at least 800 hours of formal training! In 2013 she was on Team Vega. In 2015 she was privileged to be a Brand Ambassador for SOLS custom orthotics, teaching yoga at their facilities in NYC. She is also a sponsored teacher with Aurorae Yoga. Carri the Can-do and Will-do girl! I met Carri on a month long Yoga teaching training course in Kerala back in 2011 and I immediately warmed to her. We were room mates and she was the most kind, straight talking, helpful person I could have wished to share that month with. I learned valuable travel tips from her, she was a true motivation to focus and study when needed, and always with a light hearted laugh. Carri's energy, belief, resilience and big heartedness was such a inspiration and I knew she would go on to be a wonderful teacher. She has a committed practice backed up with immense knowledge, an innate awareness of others and all wrapped in humour and kindness that make her a joy to be around. My only problem is that she lives in the US and I'm in Ireland and I don't get to see half enough of her!! Lucky you who get Carri as your yoga teacher! I was lucky enough to have 200 hours teacher training with Carri in 2015. I wish I could do it all over again! Loved it! She is an excellent teacher and a lot of fun to be around. Carri is an experienced teacher who delivers a perfect blend of both body and mind elements in class while offering a fun and playful experience. She is relatable, personable, and someone you will leave class wanting to be friends with. Carri was my teacher for 200-hour YTT. She is extremely knowledgeable in all aspects of yoga, and teaching is clear, concise and second nature for her. 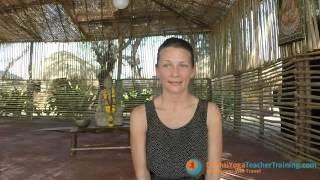 She is highly skilled in both Ashtanga and Vinyasa teaching. I had the pleasure of meeting Carri 2 summers ago while attending her Drishti yoga teacher training programme in Santorini, Greece. I was struck by her warmth, humour and down to earth nature. She gave thorough instruction and shared her expertise generously. I have a high regard of Carri as a teacher and person. Guess what? I met her again this past summer when I joined Drishti's 100hr advanced training in Portugal. Again, Carri was completely professional, warm and always inspiring. As a yoga teacher I can only talk and think positively about her. Looking forward to another adventure, Carri! Carri's magic is in her ability to make yoga accessible for everyone. She can adapt her teachings to the most advanced or most novice student. I look to her as a mentor for advise on yoga and life and she seems to always be available even when travelling the word. Carri is simply amazing! Carri is not only knowledgeable but fun to be around. All in all a great teacher. Recently finished by YYT with Drishti and Carri Uranga. Amazing teacher: kind and insightful. Strength is unsurpassed and I learned so much during my time with Carri. Would highly recommend training with her and hope to enrol for another one soon. Carrie taught me to be the best yoga teacher I can be. A wonderful teacher, motivational and inspirational. I look up to her and love learning from on her. I did my 200 hours teacher training with Carri and she was just the perfect person to guide me through this intense training. Her amazing fun and happy energy is simply infectious. I learnt a lot from her. This teacher has motivated me to be a stronger yogi and human being. Inspirational strong and great! I was lucky enough to be trained under Carri for my 200 ryt hours. She's a lifelong student & teacher who is fun, humorous, dedicated and real. I can't say enough good things about this gal. Carri is such an inspiring and motivating teacher. She encourages you to go to your edge, but also practices a lot of common sense, making practice available to anyone. She's very free-spirited, funny, and doesn't take the practice too serious. I attended her class for about a year, and after attending, chose to pursue my own yoga teacher certification. Carri's amazing, definitely an worthwhile experience going to her class! Carri is not only a great Yoga teacher, she also knows what people need and has the special ability to make everybody feel important. Carri is a great teacher! A very motivating and inspiring teacher ! I recently did a 200hour intensive training with carry and she was amazing , she made everyone smile and laugh with her incredible sense of humour , she pushed us when we needed it but also knew when to take the seriousness out of the challenging poses and just have fun with it , yoga with carri is fun and intense at the same time , I would recommend taking one of her classes to anyone! I recently had the unique opportunity to study for 3 weeks with Carri. She has an uncanny ability to stretch you to your limits while supporting your exactly where you are. You'll laugh and cry, question and learn, and come away with a clearer focus and sense of purpose. I miss Carrie in Philadelphia. She really loves what she does, and it makes the class that much more enjoyable. She encourages her students to try new things (headstands! ), and offers lots of options. Also great music! Yes, powerful and positive energy is this amazing Yoga teacher, very funny and direct as they get, love her class, not for a wimp, her class will make you strong. I have been honor to know Carri for many years it is wonderful to see someone so good get even better, As a Yoga retreat owner I have invited her several times to come teach at Samana Chakra in Peru, she is that good, can't get enough, now she also does teacher trainings and she excels at that too. well rounded teacher, love her. Carri is a great teacher. She is powerful, strong, full of encouragement and positive strength. Carri taught me through my 200 hrs yoga teacher training and I really enjoyed all the time I got to spend from her and learn from her. She is knowledgeable and has a passion to share this knowledge. Her interest in the anatomy is infectious. I thoroughly enjoyed all of Carri's classes, and her introduction to Pilates was great. Carri has a deep interest in core stability. You New Yorkers are incredibly lucky to have her and I couldn't recommend her highly enough to any lucky aspiring yogis.